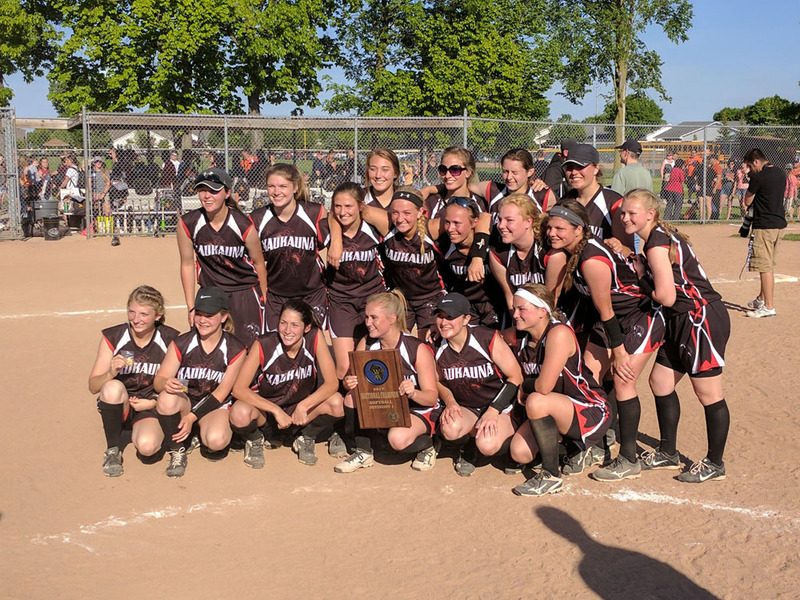 KAUKAUNA — After coming up short in sectional play the past six years following its 2010 state championship, the Kaukauna Ghosts finally earned a trip back to the WIAA state tournament. Kaukauna plays in the Division 1 quarterfinals at 12:30 p.m. Thursday, June 8, 2017 on Goodman Diamond at the University of Wisconsin – Madison. A sendoff is planned for 9:30 a.m. on Wednesday, June 7, 2017 beginning at the high school. The Galloping Ghosts are led by senior Haley Hestekin, who will play for the UW Badgers next season. Her two-run homerun, shutout-pitching performance against Pulaski in the Sectional final propelled the team to state. The Ghosts face No. 1 state-ranked Oshkosh North for the third time this season. Kaukauna’s only losses this season are to Oshkosh North. Oshkosh North returns to the State Tournament for the second straight year and for the third time overall and for the first time since 1978. Both of the Spartans’ previous experiences resulted in a defeat in the quarterfinals. North’s return to the tournament field is a result of an 8-0 blanking of last year’s runner-up Watertown in the sectional final held in Oshkosh. During the regular season, they placed atop the standings in the Fox Valley Association. The Spartans have outscored their three tournament opponents 40-0 to advance to the quarterfinals. TOURNAMENT SCHEDULE AND PAIRINGS: The single elimination tournament features five divisions for the first time. Eight teams qualify in Division 1 and four each in Divisions 2, 3, 4 and 5. The second game of each session will begin approximately 30 minutes following the first game. Game-1: Wilmot Union (22-4) vs. Germantown (17-9) – 8 a.m.
Game-3: Kaukauna (26-2) vs. Oshkosh North (25-4) – 12:30 p.m.
Game-1: McDonell Catholic (20-4) vs. Belmont (28-2) – 5 p.m.
Game-1: Phillips (21-1) vs. Juda/Albany (25-2)_- 9 p.m.
Game-1: Bloomer (24-4) vs. Laconia (23-0) – 10 a.m.
Game-1: Rice Lake (21-7) vs. Kewaskum (25-3) – 2:30 p.m.
Game 5: Winner of Game 1 vs. Winner of Game 2 – 7 p.m.
Division 5 Championship Game – 8 a.m.
Division 2 Championship Game – 4 p.m.
PRE-FINALS LIVE ON NFHS NETWORK: The Division 1 quarterfinals and the semifinals of all five divisions of the WIAA State Softball Tournament will be streamed live on the WIAA.TV portal of the NFHS_Network on a subscription basis. To purchase a subscription to the live programming, log-on to www.nfhsnetwork.com and click on the subscription graphic in the middle of the page. FINALS AIRED LIVE ON FS WISCONSIN: Watch the WIAA State Softball Tournament finals on the FS_Wisconsin or the FS Wisconsin Plus Channel. The Divisions 2, 3, 4 and 5 championships with air on FS Wisconsin, and the Division 1 final will be aired on FS Wisconsin Plus. Check local cable listings for the channel in your area. The championship finals will also be streamed live on the FoxSportsGo app. LAST YEAR: Stevens Point won its membership-leading ninth championship by capturing the Division 1 title with a convincing 16-4 victory over Watertown in the championship game. New Berlin West won the Division 2 title by edging Delavan-Darien 2-1 in the final. Laconia was the Division 3 champion for the second straight season with a 3-2 victory over Grantsburg in the State final, and Thorp won the Division 4 title by defeating Southwestern 9-2 in the championship game. THE DIVISION 1 FIELD: Last year’s champion Stevens Point is making its 18th overall appearance at State. The Panthers have won the most State championships of any member school with nine. They won four straight titles from 2001-04, won back-to-back titles in 2008-09 and added championships in 2011 and 2016. In addition, they captured the State Class A championship in 1986. Furthermore, they were runners-up in 1985 and 2000. They are the champions of the Wisconsin Valley Conference this year, and they advance to State from the Chippewa Falls Sectional following a 5-4 win over Chippewa Falls in the final. Wilmot Union returns to the State Tournament field for the first time since a runner-up finish in 2011 and for the ninth time overall. The Panthers claimed the Class B championship in 1990. They made five appearances during the 1980s, one (1982) resulted in a runner-up finish. The Panthers were runners-up in the Southern Lakes Conference this spring. They outscored perennial power Westosha Central 11-9 in the final of the Burlington Sectional to return to State. Oak Creek is making its eighth trip to the State Tournament and its first since 2008. The Knights’ most notable experience in the tourney was a runner-up finish in 2005. They finished first in the Southeast Conference and qualified for State by virtue of their 7-2 win over Kenosha Bradford/Reuther in the Bradford Sectional final. Germantown will appear in the State Tournament for the seventh time overall and for the fifth time in the past six seasons. The Warhawks’ first appearance at State produced a Division 1 championship in 1996, but they haven’t advanced past the semifinals in their five most recent experiences. They finished second in the North Shore Conference standings this season. They advance as representatives out of the Kettle Moraine Sectional with a 10-0 win over Divine Savior Holy Angels in five innings in the final. Menomonee Falls is participating in its fifth State Tournament overall and for the first time since 2014. The Indians’ advance to the semifinals in 2014 represents the most notable finish. The Indians are the champions of the Greater Metro Conference this season. Their return to the final field of eight was earned by outlasting Kettle Moraine 3-2 in 13 innings in the second final held at Waukesha North. Sun Prairie returns to State for the first time since 2013. The Cardinals are appearing at State for the fourth time overall. Their most notable finish was a runner-up result in 2012. They are the champions of the Big Eight Conference this season, and they earned their return to State with a 10-5 win over Holmen in the Verona Sectional final. THE DIVISION 2 FIELD: New London will make its fifth consecutive appearance at State and its sixth overall. They won the State title in 2013 and were runners-up in 2005 and 2014. The Bulldogs’ 7-4 win over Demark in the Winneconne Sectional final extended their streak of appearances. They finished in a first-place tie with Seymour in the Bay Conference standings this spring. Turner qualifies for State for the fourth time and for the second time in three years. The most notable experience was a runner-up finish in Division 3 in 2002. The Trojans ousted Evansville 3-0 in the final of the Delavan-Darien Sectional to earn their berth in the State Tournament field. They are the champions of the South Division of the Rock Valley Conference this season. Rice Lake returns to State for the sixth time, and for the first time since they finished runner-up in 2010. The Warriors qualified four times in five years between 2004-08. Their first-ever appearance resulted in a State title in 2004. They finished second in the Big Rivers Conference this season and advanced along the tournament trail through the Medford Sectional, culminating with an 11-2 victory over Baldwin-Woodville in the final. Kewaskum advances to the State semifinals for the first time following its 4-0 shutout victory over Whitnall in the Waupun Sectional. The Indians finished second in the East Central Conference during the regular season. THE DIVISION 3 FIELD: Laconia seeks a third consecutive championship after winning the title the last two seasons. The Spartans advance to the semifinals for the third straight season and for the fifth time overall. The Spartans’ experiences in the State Tournament in 2009 and 2014 resulted in runner-up finishes. This season, they are the champions in the Flyway Conference. They advance to State through the sectional they hosted with a 9-0 shutout over Random Lake in the final. Bloomer advances to the State Tournament for the second time in the past three seasons and for the third time overall. The Blackhawks have fallen in the semifinals in both their previous experiences. They are the champions of the Heart O’ North Conference this season. Their return to the State Tournament comes virtue of a 11-3 victory over Northwestern in the Bloomer Sectional final. Marshall returns to the tournament field for the first time since 1994 and for the seventh time overall. The Cardinals have won three State championships and have finished runner-up an additional two times. They won the Class C title in 1987 and 1989, and the Division 3 in their most recent appearance in 1994. Their runner-up finishes came in Class C in 1990 and in Division 3 in 1991. The Cardinals are the champions of the South Division of the Capitol Conference this spring. They won the Lancaster Sectional by downing Arcadia 11-8 in nine innings to advance to the State semifinals. Weyauwega-Fremont qualifies for the third time and the first time since 2009. The Indians’ first appearance resulted in a runner-up finish in 2004. The Indians are champions of the Central Wisconsin Conference this season. They have qualified through the Chilton Sectional with a 6-5 win over Southern Door in the final. THE DIVISION 4 FIELD: Pacelli qualifies for State for the seventh time and for the first time since winning the State title in 2015. The Cardinals also won a Division 3 title in 2012 and the Division 4 championship in 2003. In addition, they finished runner-up in Division 3 in 2011. Prior to joining the WIAA, the Cardinals won six consecutive titles from 1992-97 while a member of WISAA. This season, they finished third in the Central Wisconsin 8 Conference and have advanced through the Tri-County Sectional with a 8-6 victory over Cochrane-Fountain City in the final. Juda/Albany is appearing in the State Tournament for the second time in the past three seasons after its first-ever experience in 2015, which resulted in a loss in the semifinals. The Panthers advance to the State semifinals following a 6-1 triumph over Iowa-Grant in the Darlington Sectional final. During the regular season, they finished first in the East Division of the Six Rivers Conference standings. Phillips is appearing in the State Tournament for the first time. The Loggers advance to the State semifinals with a 6-5 win over Marathon in sectional final played at Marathon. This spring, they finished first in the North Division of the Marawood Conference standings. Shiocton is also appearing in the State Tournament for the first time following a 6-4 triumph over Lourdes Academy in the Oshkosh Sectional final. The Chiefs placed second behind Division 3 qualifier Weyauwega-Fremont in the Central Wisconsin 8 Conference this year. THE_DIVISION 5 FIELD: Belmont returns to the State semifinals for the first time since 2009 and for the sixth time overall. The Braves won the State championship in Division 4 in 2002 and finished runner-up in back-to-back seasons in 2003 and 2006. They earned a berth in this year’s State Tournament with a resounding 13-0 victory over Black Hawk in the sectional final hosted at Belmont. They are the champions of West Division of the Six Rivers Conference. McDonell Central makes its fifth appearance at State and its second in the past three seasons. The Macks won the State championship in 2008 and have finished runner-up twice, in Division 3 in their first-ever tournament experience in 2005 and again in Division 4 in 2011. This season, the Macks finished second in the Western Division of the Cloverbelt Conference. They trounced Birchwood 10-0 in six innings in the Bruce Sectional final to join the tourney field. Wausaukee will be playing in its fourth State Tournament and its first since 2002. They won the Division 3 championship in 1996 and have been eliminated from title contention in the semifinals in 1995 and 2002. The Rangers downed Elkhart Lake-Glenbeulah 7-5 in the sectional final hosted at New Holstein. They finished 3rd in the Marinette & Oconto Conference this season. Blair-Taylor advances to the State Tournament for the first time in the program’s history after defeating Cashton 7-3 in the Black River Falls Sectional final. The Wildcats were the second-place finishers in the Dairyland Conference this spring. NEED THE QUALIFIERS? : Information for qualifying teams in the State Tournament are available on the restricted media area of the WIAA_website. FOLLOW THE TOURNEY ON TWITTER: Receive the updates of the State Softball Tournament on the WIAA State Tournament Twitter account @wiaawistate with the hashtag #wiaasoftball. Also like us on Facebook, follow us on Instagram at wiaawi, and add us on Snapchat at wiaawis. NEED RESULTS? : The quickest way to get results will be to access the softball homepage on the WIAA website at: http://www.wiaawi.org/Sports/Softball.aspx and choose the appropriate results links. PARKING AT GOODMAN: Parking permits for media with in-and-out privileges in Lots 60 and 76 near Goodman Diamond will be available for purchase. Media will be allowed to temporarily access the circle in front of the stadium to drop off equipment prior to parking. Please plan accordingly.